THIS IS NOT A FULL LIST OF JUAN SOTO CARDS. RATHER, IT CHARTS SOME OF HIS MORE SIGNIFICANT EARLY RELEASES THAT DON’T CARRY THE TRADITIONAL RC TAG. The 2016 Bowman Chrome Juan Soto autograph is his key card. 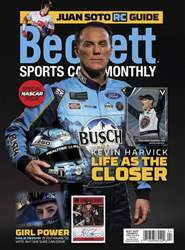 By definition, it’s an insert so it doesn’t carry the RC tag. That said, as the hobby has continued to evolve, first Bowman Chrome autographs have become the cornerstone pieces for virtually every player. They have on-card autographs, players are in their MLB uniforms and the brand has a long history. Then there are the Refractors that add color and a certain level of rarity. 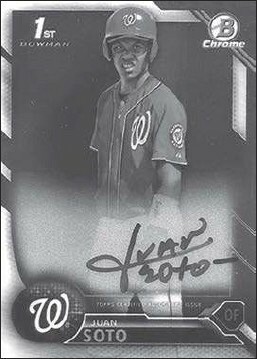 When it comes to the 2016 Bowman Chrome Juan Soto autograph Refractors, all are serial numbered withthe one-of-a-kind Superfractor being the most coveted (and expensive).